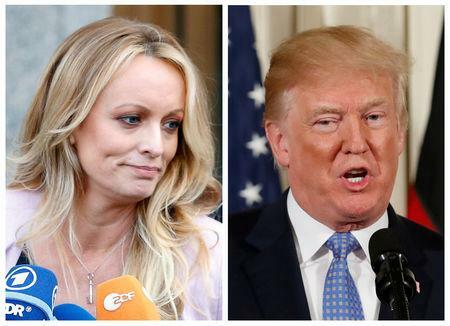 WASHINGTON (Reuters) - A U.S. judge on Monday dismissed adult film actress Stormy Daniels's defamation lawsuit against President Donald Trump and ordered her to pay his attorney's fees, saying a tweet the president had written referring to her was protected by free-speech laws. Daniels' lawyer, Michael Avenatti, said they would appeal the decision. Trump responded by dismissing her claims in a tweet, saying, "A sketch years later about a nonexistent man. A total con job, playing the Fake News Media for Fools (but they know it)!" In his ruling, Judge S. James Otero said Trump's tweet was protected by freedom of speech. "The Court agrees with Mr. Trump's argument because the tweet in question constitutes 'rhetorical hyperbole' normally associated with politics and public discourse in the United States. The First Amendment protects this type of rhetorical statement," Otero wrote. Otero presides over both lawsuits. Charles Harder, Trump's lawyer, said the amount of the award for Trump's attorneys' fees would be determined later.